As the number one global Bulk Messenger, Ozeki Bulk Messenger is capable of merging two or more address books into one list. Below we will describe you how to combine two existing address books in our premium Bulk Messenger software. 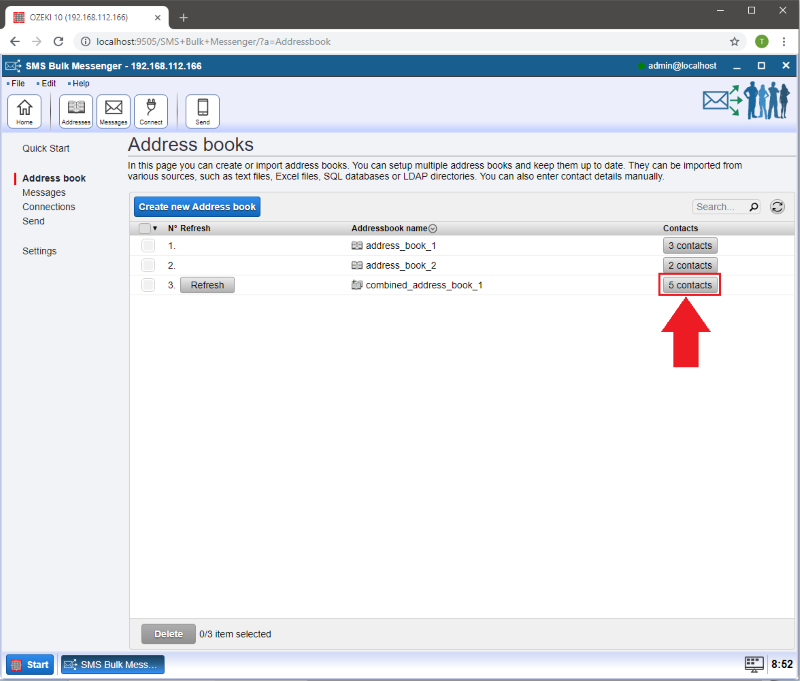 On the 'Quick Start' page of Ozeki Bulk Messenger please select 'Step 1 - Address books'. You will be directed to the Address books page where you can create a new address book and select its type. Click on the 'Create new Address book' button and select the 'Combined' type. In the 'Address book name:' section you can give a name for your new combined address book to make identification easier. 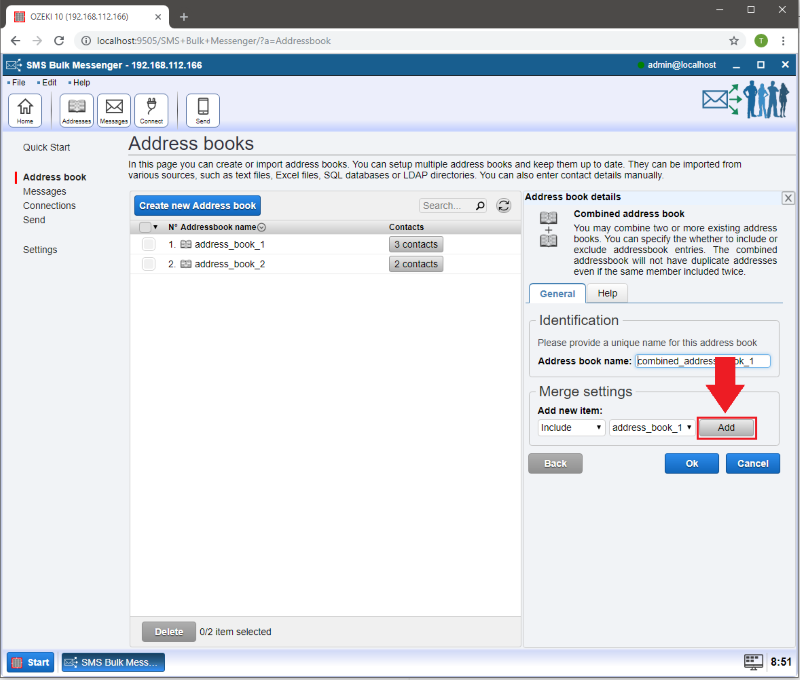 You can specify the 'Merge settings' of all added address books one by one. The 'include' rule does not allow duplicate contacts, the 'exclude' rule removes all occurences of the same contact, so it works like a duplicate contacts remover. Choose the address books you would like to merge and click on 'Add' then 'Ok' . You have successfully merged your address books. Click on 'Contacts' to manage your contacts. 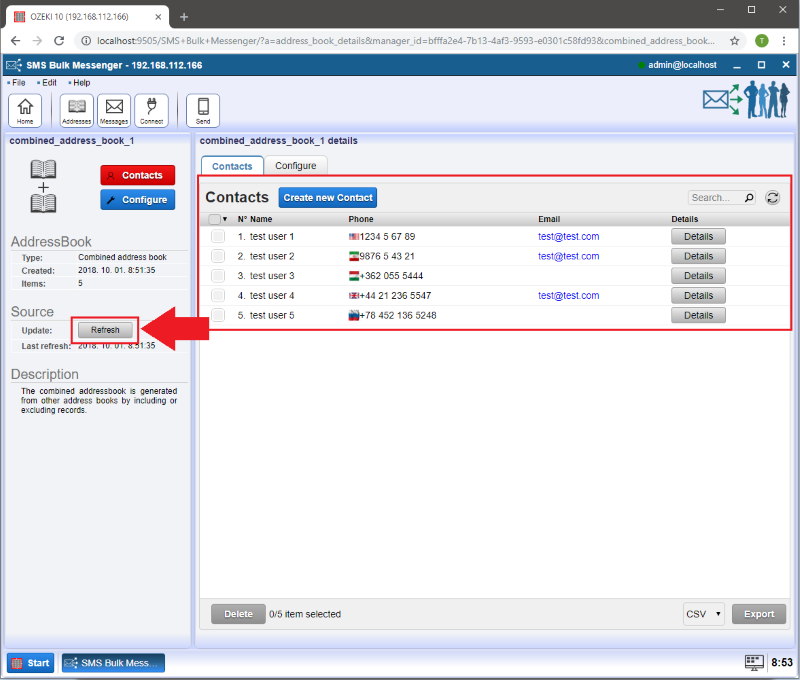 Here you can manage the contacts of your newly combined address book. If you click on the "Refresh" button you can refresh your database. WARNING: By clicking on the refresh button, the refreshing process will delete all your contacts and load the original contacts from your merged databases. If you edit a contact the new details will not be saved to the original database.